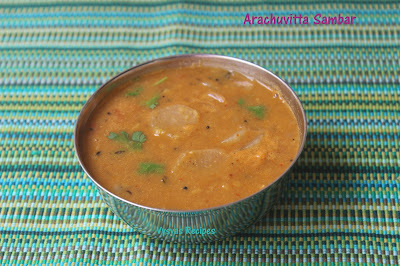 Arachu Vitta Sambar(Noori pettina pulusu) is an authentic South Indian Recipe.This Sambar is prepared with freshly ground spices.It goes very with Idli,dosa,Pongal,chapathi,and rice.Aroma of this sambar pulls everyone.You can add any kind of veggies like brinjal,drumstick,carrot, beans,chow chow,radish,ash guard,turnip or mixed veggies like carrot,beans,potato, brinjal,&drumstick. you could see more veggies combination in my Mixed vegetable sambar.During Vrat or festive occasions you could make this sambar ,just by excluding onions.Taste won't make much difference. Toor dal - 3/4 cup. red chillies - 6 to 7. Pressure cook toor dal by adding a turmeric with needed water for 4 to 5 whistles.Once the pressure subsides, mash the dal well till mushy with ladle. Prepare tamarind extract by soaking tamarind in water for 1/2 an hour.Then throw the pulp then retain the tamarind extract. Peel the skin of radish and cut it into thin circular disc & pressure cook it seperately with toor dal. (Usually I cover toor dal vessel in a cooker with a plate, upon which i place raddish). Dry roast every thing together except coconut, given in a 'To Saute & Grind 'Column, till all the ingredients turns golden brown colour then add coconut,switch off the flame. saute coconut, in heat of the pan for few seconds.Then grind it into a smooth paste with needed water.Now ground Paste is Ready. Heat the oil, add mustard seeds, when it splutters add cumin seeds, fenugreek seeds,curry leaves & hing. when cumin seeds sizzles, add shallots, saute till it turns pink. Then add tomato, saute till tomatoes turns mushy. Then add tamarind extract, cooked Raddish & ground paste,Mix well. Let it boil for few 3 -4 minutes. Then add needed water,Mashed toor dal & salt. stir well, let it boil for couple of minutes, till it gets Sambar consistency. 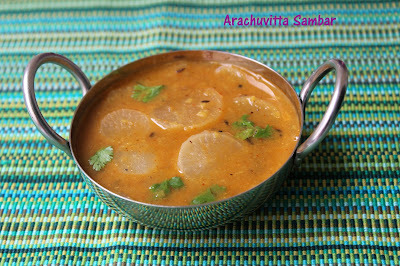 (Adjust water according to sambar consistency).Garnish with fresh cilantro. Choosing the veggies, is extremely your choice. Instead of Raddish you can use Carrot,beans, chow chow, drumstick,brinjal ,potato,broad beans or any mixed vegetables. Instead of pressure cooking the Radish, you can cook it, in a kadai with needed water till soft. 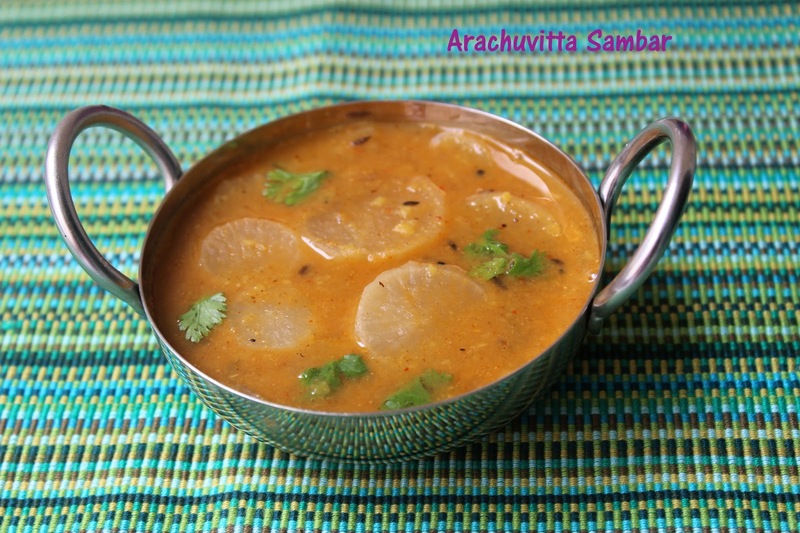 Adjust water, according to sambar consistency. It Goes well with idli,Dosa, Pongal & Chapathi.